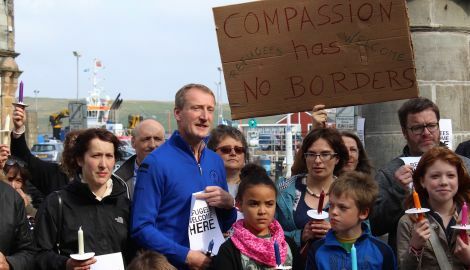 SHETLAND Solidarity with Refugees, the group set up 10 days ago to organise donations for some of the hundreds of thousands of displaced people across Europe, is setting up a local support network should Shetland be required to accommodate refugees. Group spokeswoman Wendy Sinclair was one of between 60 and 70 islanders who gathered at Lerwick Market Cross at midday on Saturday for an hour-long candlelight vigil to demonstrate their solidarity with Syrian refugees. 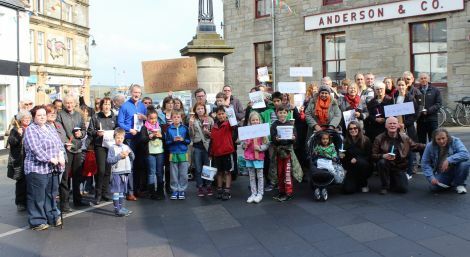 The Shetland Sees Syria vigil was part of a network of events held across Europe on Saturday in support of constructive help for those forced to flee their country. Several of those attending said they were prepared to open their homes to refugees, adding that welcoming new people would be beneficial for the isles. Shetland MSP Tavish Scott and South Mainland SIC councillor Allison Duncan were the only local politicians attending the vigil. Local music teacher Deirdre Hayward said the time for talking was over and something practical needed to be done. “There has been a lot of talking but we need to actually do something. Her husband Nigel added that the world was facing an unprecedented situation. “There has been nothing like this since the last World War and people have to start thinking out of the box. You can’t go down conventional channels here, it needs a huge leap into a new way of thinking,” he said. Their views were supported by Lerwick man Alan Mackay, who said the extent of local support was much larger than the number of people who had turned out at the Market Cross might suggest. “Although there is not a huge crowd here most people are really happy to support something like this, I know people have been donating clothes and money – the silent majority are all contributing. 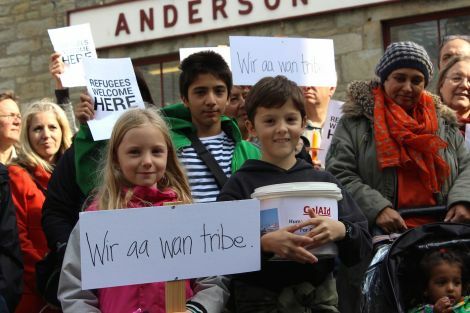 “My heart tells me that local people would welcome refugees coming to Shetland. Tavish Scott said he was supporting the Scottish government and its commitment to welcome refugees to Scotland. “All our local authorities including SIC will have to play a constructive role in finding accommodation here in Shetland and in other parts of the country, the Scottish Government is rightly working with local authorities trying to make that happen,” he said. The MSP added that one of the practical things that could be done through the Scottish parliament would be to make pensioners’ free travel passes available to refugees. Wendy Sinclair said she felt empowered by the support she and her group of volunteers have been receiving over the last week or two. “My enthusiasm just exploded, and from that I never stopped; it is just one thing after the other, it just flourished. Sinclair said the first priority was to ensure that all the donations were taken care of and made ready to be shipped to Calais towards the end of the month. However, the Shetland Solidarity with Refugees group has already started to prepare itself for the possibility that refugees might come to Shetland. She said she was planning to set up meetings with the SIC next week, and was also hoping to discuss the way forward with Tavish Scott. “This group is not going to disappear. We are here to help,” she said.